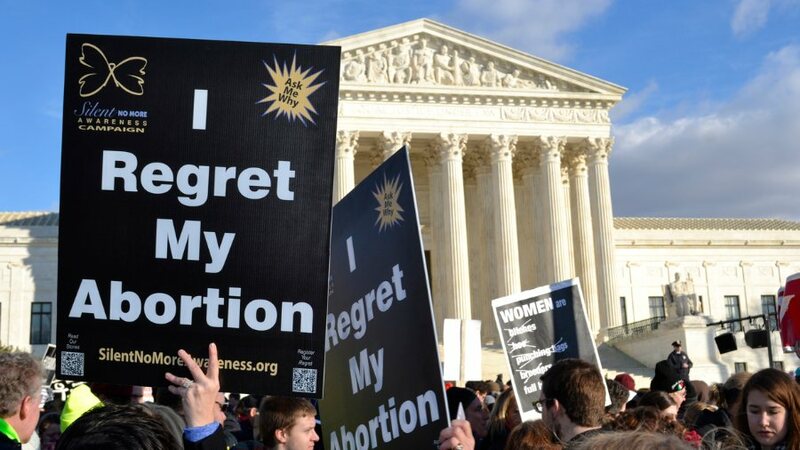 Marchers hold "I Regret My Abortion" signs at the U.S. Supreme Court in Washington D.C. on the annual March For Life Rally January 22, 2015. Around this time each year, Americans of good conscience take time to grieve over the breathtaking loss of human life since the infamous Roe v. Wade decision. Abortionists have killed more than 60 Million innocent human beings since the Supreme Court rendered that dreadful decision on January 22, 1973. In the decades since, the pro-life movement has worked to make incremental changes in abortion policy. We have worked hard to set limits on the circumstances in which women can obtain abortions. But as far as the ultimate question — whether a pregnant woman really has the right to choose whether another human being lives or dies — we’ve been stuck. Not stuck because we don’t know the right answer, but stuck without a way to change the wrong answer the Supreme Court gave us in Roe. Because according to the principle of stare decisis, court precedents are treated as law for future cases. Abortion policy in the 50 states is a hypocritical mess because of Roe and its progeny. Today states have laws that, in all sorts of ways, recognize the humanity of babies in the womb. Make no mistake: Roe v. Wade was unsound the moment it was decided. But today, its unsoundness is clearer than ever. The decision was backward, illogical and hypocritical, and it must fall. It was backward in that it made the U.S. a barbaric outlier with lax abortion policies. Even European nations considered to be “liberal” and “progressive” mostly restrict abortion to the first trimester. But it was also backward in its reasoning. The Court denied unborn babies the protection of the explicit “right to life” in the Fourteenth Amendment, ignoring very clear scientific evidence that babies in the womb are distinct, living, human beings. From the other side of its mouth, it confirmed a “right to privacy” — which appears nowhere in the Constitution — that it said gave women the right to have abortions. Abortion policy in the 50 states is a hypocritical mess because of Roe and its progeny. Today states have laws that, in all sorts of ways, recognize the humanity of babies in the womb. Some states require abortionists to inform women that their unborn babies can feel pain. Others go so far as to recognize, in their laws, that unborn children are human beings from conception, and are therefore legal “persons” for purposes of state law. And then we have this glaring contradiction: In many states, a person who kills an unborn baby can be found guilty of homicide. But if that very same baby’s mother, on the very same day, had chosen to end the baby’s life, she would enjoy an unfettered, constitutional “right” to do so, by virtue of Supreme Court precedent. You don’t have to be a lawyer to see that this is just plain wrong. Some have compared the moral imperative to reverse Roe v. Wade to that which compelled the Court to reverse the Plessy v. Ferguson precedent that once justified racial segregation. The comparison is apt. Not only were both decisions wrong when they were issued, but in both cases, time has made their legal and moral defects painfully obvious. Like ending slavery and segregation, reversing Roe won’t be easy. But it is right. Of course, that doesn’t make the reversal of such a landmark precedent easy for everyone to swallow. Racists didn’t accept desegregation graciously; they resisted. Slave owners didn’t embrace emancipation. So when we talk about reversing Roe v. Wade, we should expect fierce resistance from those who think it their “right” to choose whether another, weaker human being will live or die. And because that hasn’t been enough, in the past, to get the job done, I offer this to the Court: The legal landscape has changed since Roe v. Wade. It has changed in a way that justifies a departure from stare decisis. The states have recognized in many contexts that a baby in the womb isn’t a wart, or an impersonal mass of cells. She isn’t someone’s property, to be disposed of at will. The baby in the womb is a member of our human family — a person. And our Constitution protects her life, not only from the criminal on the street, but from anyone who fails to recognize her inherent dignity and value.